Dawn issued another awesome color challenge this week. It's more fall like colors, but boy am I ready for fall to be here! I do not like the sweltering heat! I want to be able to go outside with the kids! Plus, I'm still nursing so I still get super hot all the time. I channeled Ryann a little bit on this card. I'm sure it's obvious. :) The base is Kraft. The designer paper is Basic Grey. The stamp set is Unity's Feel the Joy, one of my absolute favorites! I don't have any scallop punches but I like to pretend. What I've done here is punched out circles using my 1 inch circle punch, then I glued them to the side of the paper. Voila, giant scalloped border. I finished with some bling in a nice orangey gold. Happy Thursday everyone and don't forget to come back on Saturday for the HUGE EIC Birthday Bash with fun and prizes!! SOOOO pretty! I love it! love the scallops and bling...very pretty! This is beautiful. I just love the colors and that dp. Super cute! Love your scallops! Fab job on the challenge, nice to see the BG Paper used! This absolutely gorgeous Ashley! Love love love it!!! 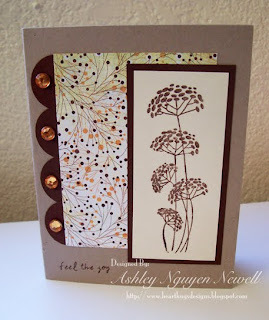 Wow i completely, utterly and totally LOVE this card!! WOW!!! It's awesome, and definitely a top pick!!! sweet card. weren't the colors fun to work with. that's one of my fave Unity stamps,looks great with that dp. How pretty - I love this, Ashley! This is gorgeous!! Love it!! And congrats on the DT! That is awesome!! Love those big ole scallops! Great bling and fun scallops. Fabulous job with Dawn's color challenge. Lovely DP! The stamp is so delicate.